It takes a long time to get to a hundred, especially as a self-published quarterly that has never been conceived as a commercially successful mass product but as a high-quality publication for photography and media-theory enthusiasts. This concept can be exemplified in the debate about the overall appearance of EIKON in the early 1990s: The landscape format caught on eventually; the editors at the time wanted to “physically” shake things up with this atypical layout, as the magazine did not fit into the ubiquitous IKEA bookcases and always irritatingly poked out (as the founder Carl Aigner put it). A total of 8,244 pages in this layout later, it gives us great pleasure to present the first of hopefully many triple-digit issues. To celebrate this new era, and under the patronage of VALIE EXPORT, we initiated the EIKON Award (45+), a Europe-wide art prize for photographers and media artists aged 45 and over that includes a prize money of 5,000 Euros, and for which 273 submissions from twenty-five nations were made. EIKON #100 presents the recipients selected by Jürgen Klauke, Margot Pilz, and Æsa Sigurjónsdóttir and showcases their work in the “Portfolio” section. This issue is also the first to sport three different covers, each with an image by one of the award-winning artists: Susan MacWilliam (who received the first prize and the prize money), Katrín Elvarsdóttir, and Gabriele Rothemann. 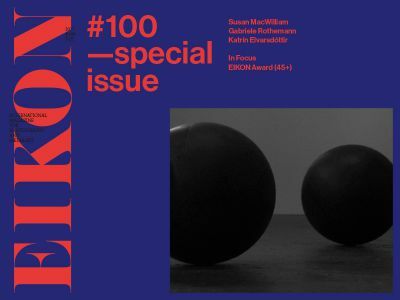 Due to the exceptional quality of the submissions, we have made the EIKON Award (45+) the general focus of this issue, with the juror Æsa Sigurjónsdóttir analyzing recent works by Ramesch Daha, Tatiana Lecomte, and Miranda Pennell, who also submitted works, concentrating on the aspect of their archival practice. Given the political shifts currently taking place in this country and many others, we hope that this award and this milestone issue will help raise awareness, as de facto equality of men and women has not yet been achieved—not even in the arts.